Throughout his career, Duke Ellington’s only competition among his fans was with his earlier ensembles. The truth is that Ellington continued to evolve steadily through the years in his writing, playing and arranging for his orchestra. 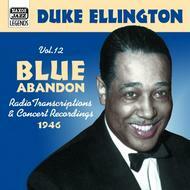 By the time these recordings were made, Ellington had been widely regarded as a genius for over fifteen years. In addition to his commercially available recordings – some of which are on Volume 11 in this series: Time’s A Wastin’ – Ellington also made a series of transcriptions specifically to be played on the radio. It is from that treasure trove that the first fourteen selections of this collection are drawn. Duke Ellington used his Carnegie Hall concerts in the 1940s as opportunities to perform extended works. His 1946 concert featured a four-part work called The Deep South Suite. Leonard Feather’s brief verbal introduction was actually recorded in the studio. The suite is an ironic ‘tribute’ to the South of the time.